Class Action-Barring Mandatory Pre-Dispute Consumer Arbitration Clauses: An Example of (and Opportunity for) Dispute System Design? 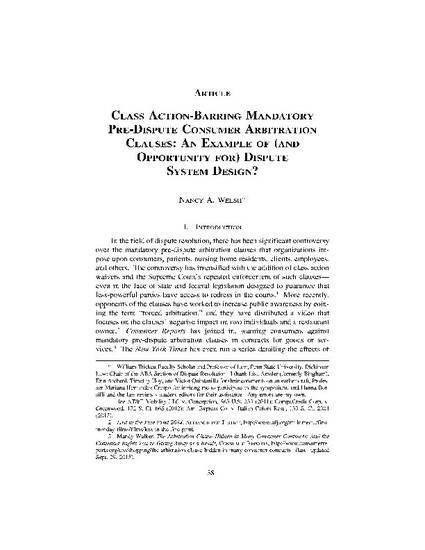 Ultimately, this essay will conclude that a private, ad hoc dispute system design process did lead to the insertion of class action waivers in mandatory pre-dispute consumer arbitration clauses. In-house and outside counsel certainly played key roles in initiating this process, but it is unclear that any individual lawyers could claim credit or responsibility as "designers." The representatives of dispute resolution organizations, meanwhile, played supporting roles-as providers of information and as amici in Supreme Court litigation. The essay will consider whether dispute resolution professionals could have managed their role in the process differently-and if so, why they would have managed it differently. This essay also concludes that the momentum generated by the CFPB's regulatory proposals has created another opportunity for dispute resolution organizations and professionals to play a role in designing a system for the resolution of disputes between consumers and businesses. However, the appropriate role played by these dispute resolution organizations and professionals depends upon the role played by the CFPB, particularly in light of the recent election. If the CFPB survives and acts as a third party, committed to hearing and considering the concerns of all stakeholders and acting in the public interest, and if the agency retains its independence and final decision-making authority over the dispute system's design, then experienced dispute resolution organizations and professionals should be able to play a very valuable dual role as both designers and stakeholders. If the CFPB does not survive or does not retain its independence and decision- making authority, then playing a dual role becomes more problematic. It will then be important to identify those dispute resolution organizations that either do not rely on referrals from corporate repeat players for their survival or those that do rely on such referrals but have nonetheless persisted in working to protect the integrity of the dispute resolution field. These are the organizations that will need to step up and play a design role for the benefit of the dispute resolution field and, even more importantly, for the benefit of our public justice system and our larger polity.